The main difference between input and output devices is that the input devices are used to send data into the computer while the output devices are used to take data out of the computer. A computer is a device that can perform multiple tasks simultaneously. There are software and hardware in a computer. Software refers to a set of instructions to perform a specific task written using a programming language. Hardware refers to the physical components of the computer. Input and output devices are two types of hardware devices. The input devices send data to the computer. On the other hand, output devices take data from the computer. Both these devices are required for the proper functioning of the entire computer. Input devices are the components that send data into the computer. There are various input devices. A keyboard is a common and a popular input device. The interface is similar to a traditional typewriter, but there are additional keys to perform extra functionalities. There are alphabetical keys such as letters, numeric keys, control keys such as Home, Insert, Delete, Page Up, Page Down, etc. and special purpose keys like Enter, Shift, Num Lock, Caps Lock, etc. The user can simply enter commands using this device. Mouse is a small palm size control device that works according to the movement of the hand. The user can click the left and right mouse buttons to perform task such as opening and closing applications. He can scroll up and down through documents using the wheel present between the buttons. The mouse mainly controls the position of the cursor on the screen, but it cannot be used to enter text. Scanner helps to get images in a paper, and it converts them to the digital form to store on the disk. Microphone is another input device which is used to input sound and to store them in digital form. Moreover, an Optical Character Reader (OCR) is used to read printed text. It scans text character by character and converts them to machine-readable code and stores them in memory. Output devices are the components that take the data from the computer. There are various output devices. 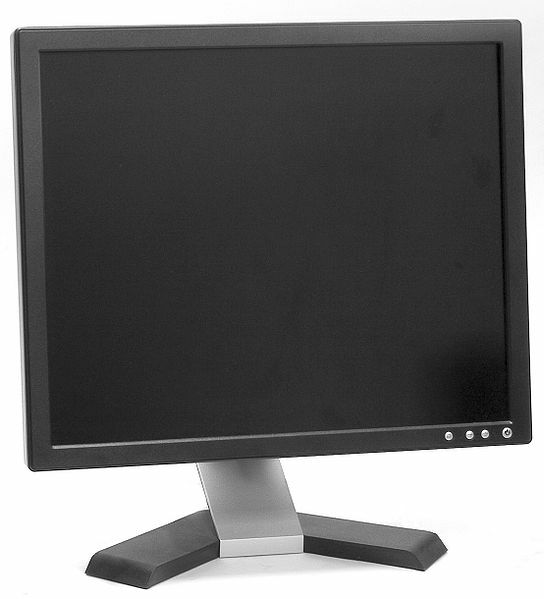 A monitor is a common output device. It is also known as Visual Display Unit (VDU). It forms images. The basic unit of each image is a pixel. The sharpness of the images increases with the number of the pixels. Printer is another output device. It helps to get data printed on paper. There are two types of printers called impact and non-impact printers. The impact printers print the characters by striking them on the ribbon which is then pressed on the paper. The non-impact printers do not use a ribbon to print the characters. Instead, they print an entire page at a time. Laser printer and inject printer are two non-impact printers. A laser printer uses light to produce dots required to form the characters to print on to the paper. Inject printers are the latest printers, and they provide high-quality printouts. These printers print characters by spraying small drops of ink on paper. Input devices are hardware components that are used to provide data and control signals to a computer. Output devices are hardware components that use received data from a computer to perform a task. Input devices send data to the computer. Output devices get the data from the computer. This functionality is the main difference between input and output devices. 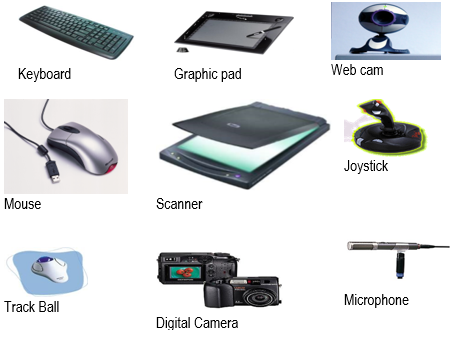 Keyboard, mouse, scanner, microphone, Optical Character Reader (OCR) are some examples of input devices. Monitor, speaker, printer are some examples of output devices. Input and output devices are two types of hardware devices. 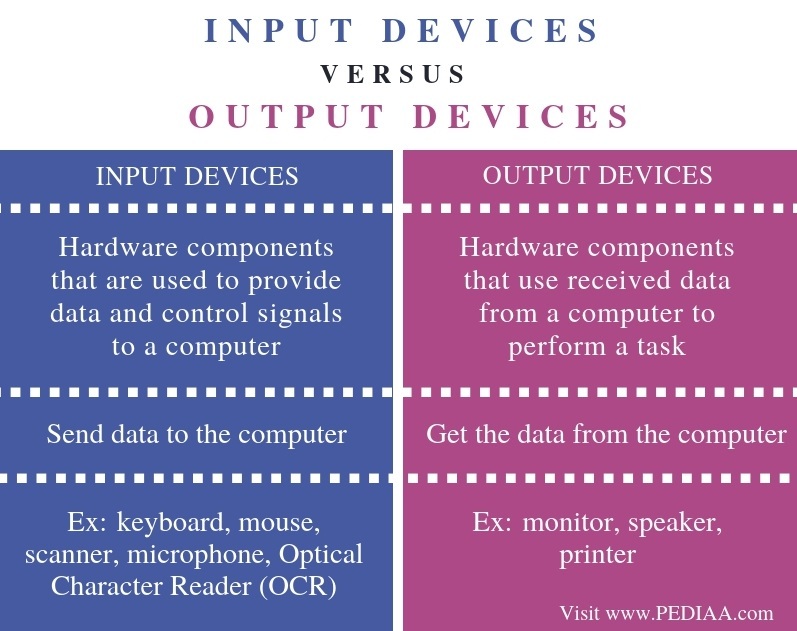 The difference between input and output devices is that input devices are used to send data into the computer while output devices are used to take data out of the computer. 1. “Computer Input Devices.” Www.tutorialspoint.com, Tutorials Point, Available here. 2. “Computer Output Devices.” Www.tutorialspoint.com, Tutorials Point, Available here.